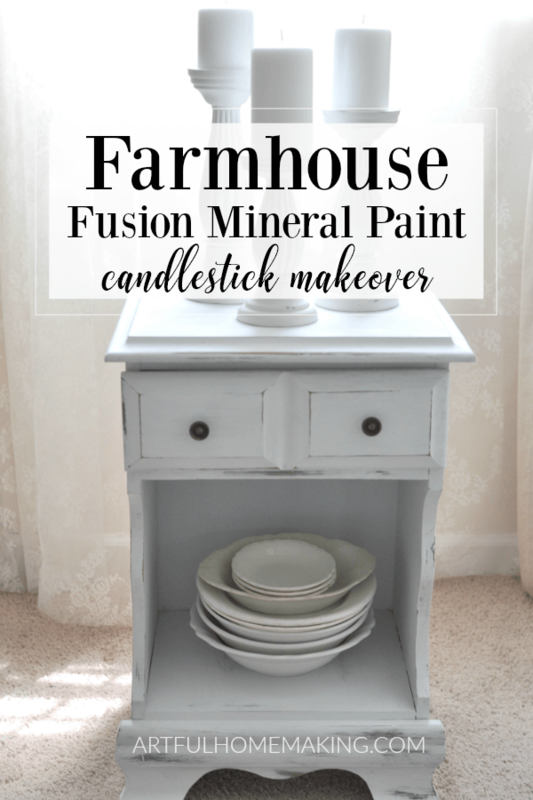 These farmhouse Fusion Mineral Paint candlesticks are just one example of how simple Fusion Mineral Paint is to use. 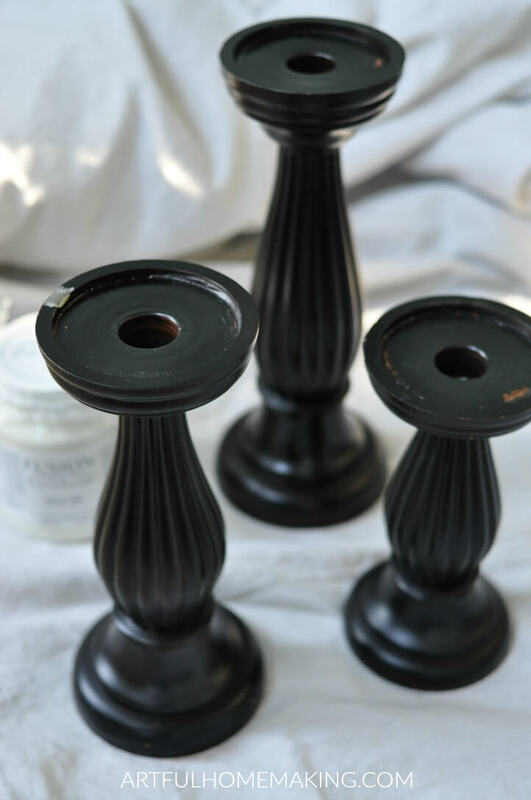 These black candlesticks have been sitting in my living room for the past seven years. I liked them when we first bought them. But everything in our house seemed so dark and heavy, and I wanted to lighten things up a bit. So, I decided it would be fun to paint them white. I’m so glad I did! As you’ll see in the photos below, they look so much brighter and have a sort of shabby chic vibe to them. I’d call it a definite improvement. 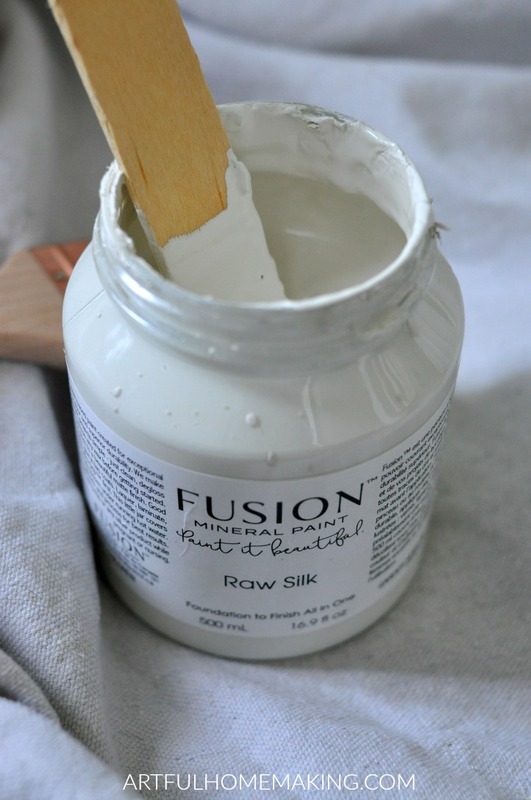 How Do I Use Fusion Mineral Paint? This wasn’t my first time to use Fusion Mineral Paint. Last summer I did a mineral paint chair makeover with this same container of paint. And it’s still not even half gone! Affiliate links included below. Read my disclosure here. One of the main questions I had when I started, was about how to use Fusion Mineral Paint. And I have to tell you, it’s really simple. In most cases, it doesn’t require a lot of prep work. For some items (like my chair), it’s s good idea to do a little bit of sanding to prepare the surface. 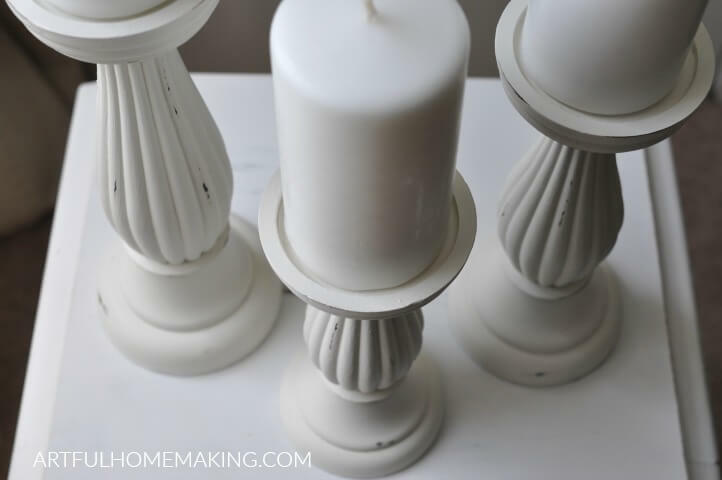 With these candlesticks, all I did was wipe them down with a damp cloth to remove any dust, and then dry them off. And then they were ready to paint! The candlesticks had some sort of black finish or paint on them, but I decided to just try painting over it to see what would happen. After one coat of paint, this is what they looked like. You can see that there is some streaking and the black finish underneath is showing through. I think most items will require at least two coats. For my chair and these candlesticks, they both took two coats. After adding a second coat of paint, they looked beautiful. I decided to lightly sand them to get a bit of a distressed finish. 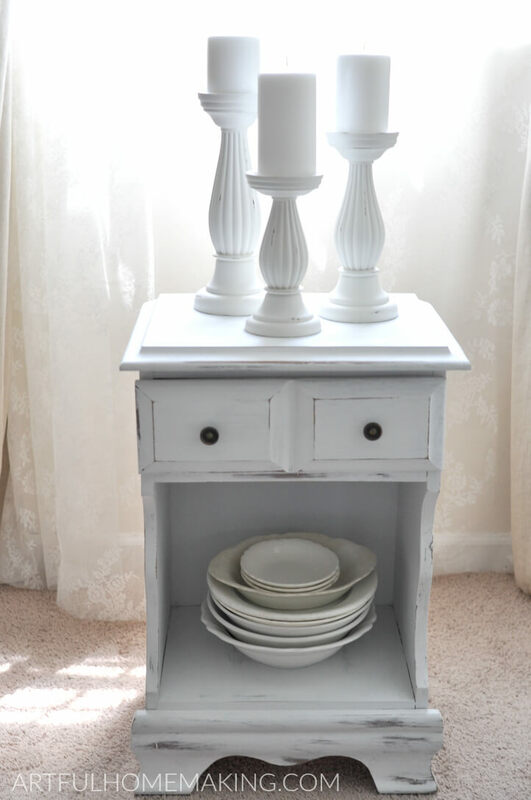 To do this, you just use a piece of sandpaper to carefully sand off some of the paint in the places where natural distressing might have taken place. One of the benefits of using Fusion Mineral Paint is that it distresses very well. But I have to tell you that, for me, the distressing is the hardest part. It’s so hard for me to mess up that perfectly smooth surface, even though I really want the distressed look. I finally told myself that if I messed up, it would be a simple matter to just paint over them again. I only distressed them a little bit. After looking at them, I think I possibly could have done a little more. In addition to being very easy to use, there are some additional benefits to using Fusion Mineral Paint. It’s very environmentally friendly. It’s non-toxic, and free of lead, ammonia, and formaldehyde. It’s also virtually odorless and has very low VOC’s (volatile organic compounds). It also requires no mixing, no priming, and no top coat. 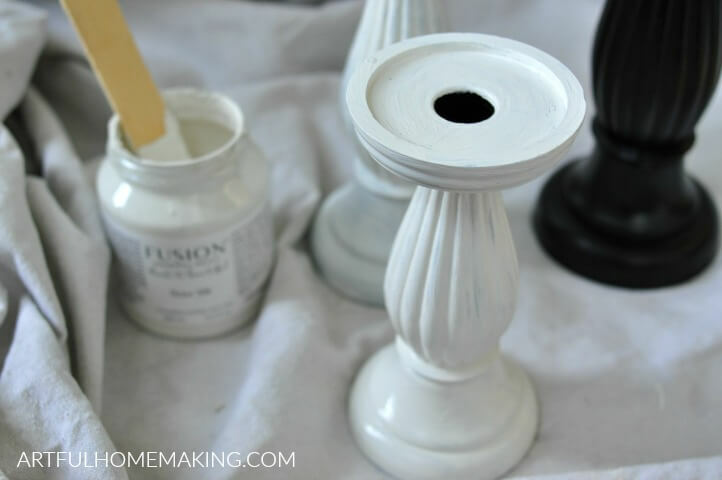 I’m really happy with my farmhouse Fusion Mineral Paint candlesticks! 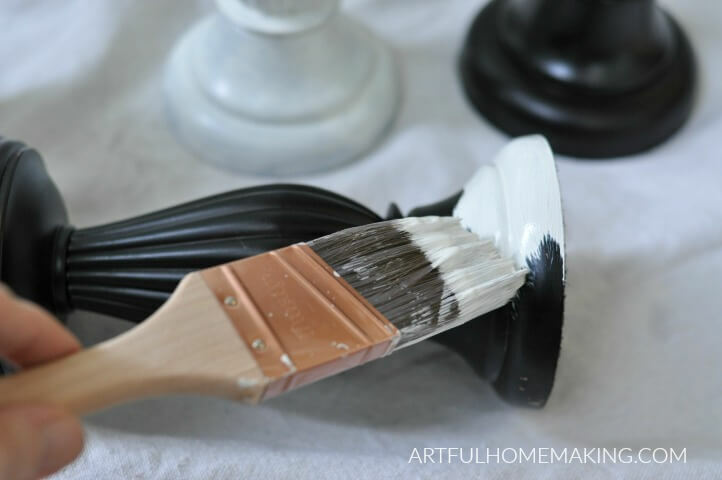 Have you ever used mineral paint? Let me know in the comments! Disclosure: This post contains affiliate links. Read my disclosure policy here. Sharing here. Best Homeschool Math + Teaching Textbooks 3.0 Giveaway! They look great. I need to do that to mine that I’ve also had for years and years. Love your collection of ironstone and those adorable curtains too! Saw this on the Reader Tip Tuesday link party. Thanks for sharing! I’d love it you link up every week at Talk of the Town! It’s every Tuesday at 6 pm central time. Thanks for the invitation, Angie! I love the power of paint. The candlesticks look terrific. I agree, paint is awesome! Thank you! LOVE these! Pinned! Visiting from Grace At Home! Thank you, Julie! So glad you stopped by today! Oh this is nice paint Joy, can it be used on anything? Yes, I believe so. So far I’ve only tried it on a chair and my candlesticks, but I’ve seen all sorts of furniture painted with it. If it’s a surface that gets heavy use, like a tabletop, I believe it’s recommended to use a sealant of some sort (I think Fusion sells one, but I haven’t looked into that yet). They look great! 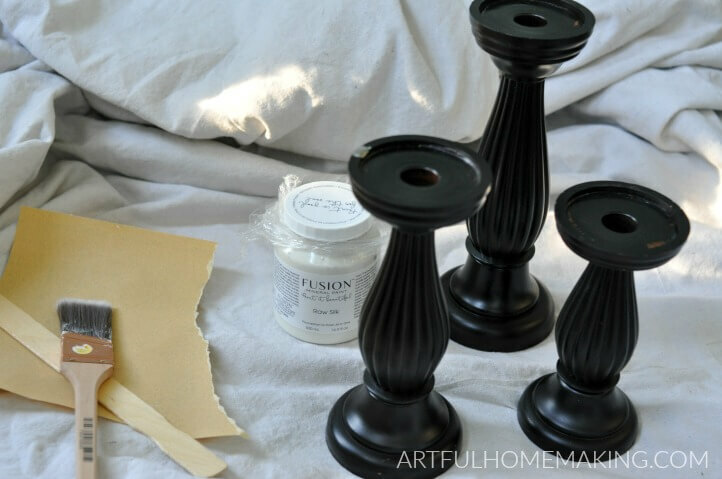 I’ve never heard of this kind of paint before and it looks so easy, can’t wait to try it out on a couple of my old chairs. Thanks for sharing! Thank you, Sara! It’s such an easy and fun paint to use!